Busy Hands Quilts: Summer Dresses! Not much quilting going on here because I've been sewing some simple colonial / Laura Ingalls Wilder-style dresses for Millie. She loves dressing in old-fashioned dresses, and I sure love the feminine fabrics she chose and the pattern's modesty. You can find the pattern here. As would be customary in this period of dress, it is made for a girl to wear for a few years, and there are three tucks in the lower skirt to let the length out, and the top will grow with her by increasing the elastic. I told her I hope she really likes the pattern and fabric because the dresses will fit for quite awhile! The dresses were quite simple to make, once I realized the many buttonholes for ribbon were unnecessary. I altered the pattern so the neckline, waist and sleeves have elastic inside rather than ribbon. Elastic is much more comfortable to wear than unstretchable ribbon, and Millie agrees and intends to wear these as everyday dresses. Next up is a white muslin chemise and pantaloons to wear under her dresses, also made from the same pattern. What a sweet dress! I love the styles she chooses too, so nice. 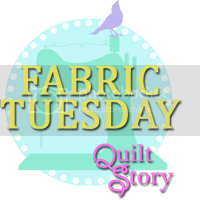 Thanks for linking to Fabric Tuesday! What a cute dress. She is so pretty and adorable. She wear it simple yet gorgeous. A lot of thanks for sharing.